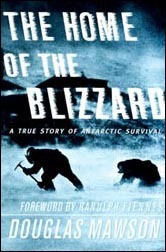 The Home of the Blizzard is a tale of discovery and adventure in the Antarctic--of pioneering deeds, great courage, heart-stopping rescues and heroic perseverance. This is Douglas Mawson's first-hand account of his years spent in sub-zero temperatures and gale-force winds. At the heart of the story is Mawson's epic sledge journey in 1912-13 during which his companions Ninnis and Mertz both perished. Told in a laconic but gripping narrative, this is a story that all armchair explorers will cherish. This classic book is also a detailed account of the Australasian Antarctic Expedition's daily subsistence on the icy continent in the early years of the century. Originally published to great acclaim in 1915, this book has been out of print for many years. The Home of the Blizzard is illustrated with over ninety original photographs depicting the wildlife, the harsh living conditions and the spirit of the explorers. With a specially commissioned foreword by Sir Ranulph Fiennes, the "world's greatest living explorer," this is a book for anyone interested in adventure and the strength of the human spirit.